A true Masonic signet ring is used as a seal to validate the authenticity of its owner. The word "Signet" comes from the word "Sign", meaning that the ring provides a symbol, a sign or a signature to officially stamp or mark important documents. 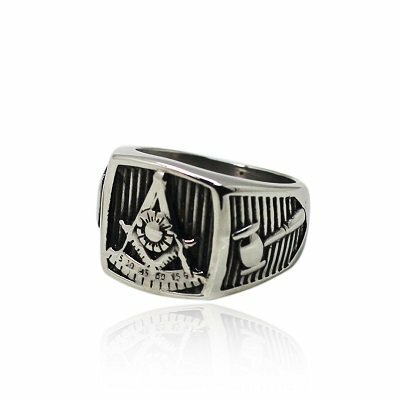 While no one knows the exact date that Masonic rings began to be worn by the fraternity, Signet rings have been a part of royalty and religion in many cultures throughout history. In past eras, Signet rings were worn by Kings, Popes, Bishops, Roman Emperors and other high ranking church officials and noblemen as a sign of their nobility, importance and power. Probably the most famous religious signet ring in the world, today, is worn by the Pope. The Pope's ring is called the "Fisherman's Ring", a massive and ornate gold seal ring, which denotes the seal of his authority. Upon the Pope's death, the Cardinals break his ring and a new signet ring is created for each new succeeding Pope. Papal rings are considered sacred and a "pre-owned" ring is not only considered unacceptable, but an abominable sacrilege (Desecration, profanation, misuse, or theft of something sacred), and therefore profane. What Does The Word, "Profane" Mean? The Masonic use of the word profane means: Pro = without, Fanum = temple. Literally, Pro-Fanum denotes a person outside the temple....or a person who has not been initiated. Therefore, a signet ring distinguished an individual as one of high social standing, a privilege, a military distinction and a rich ornament, or seal marking the dignity and importance of its wearer. These signets,...or seals provided visual and symbolic "certification" which validated acts executed in their name. They provided a visual "Plumbline of Authenticity" proving that the wearer was not only truly who he said he was, but the ring symbolized his power in the community. The theft of a signet ring was, many times, punishable by death. While originally only worn by royalty, religious officials and noblemen, as time passed, tradesmen and merchants, too began wearing these rings. Royal signet rings were lavishly decorated with precious metals, rich enamels and gems of every color and facet. Tradesmen and merchant's signet rings had mottoes or logos cut into them. Pompey: (106-48 B.C.) Pompey's signet ring displayed a lion bearing a sword. This Roman politician, Gnaeus Pompeis Magnus, better known as Pompey, was one of the greatest generals of his time. When he was in his 70's, he returned from Spain to Italy and put an end to the slave revolt led by Spartacus. His ring had an armed Venus. He is also famed for naming both the month of July after himself as well as the new calendar, which he called the Julian calendar, as well as giving February an extra day every 4th year, which we call Leap Year. He was murdered by Brutus in 44 B.C.. The date of his death is March 15...and that day has henceforth been called "The Ides of March". Due to the popularity of Shakespeare's tragedy play, Julius Caesar, his assassination during the Ides of March now signifies a fateful day. His signet ring had first a sphinx, then the head of Alexander the Great, and finally he placed his own image on his signet ring. Caesar Augustus was the grand nephew of Julius Caesar and Rome's first Emperor. In 27 B.C., the Roman Senate granted Octavian (his birth name), with the name Augustus, meaning "the exalted" when they made him Emperor over all of the Roman empire. Rome achieved great glory under Emperor Octavian/Augustus. He restored peace after 100 years of civil war; maintained an honest government and a sound currency system; extended the highway system connecting Rome with its far-flung empire; developed an efficient postal service; created free trade among the provinces; and built many bridges, aqueducts and buildings adorned with beautiful works of art created in the classical style. Literature also flourished during the time of his rule. Nero was the 5th and last of the Julio/Claudian dyanasty of Roman Emperors. His reputation is as an ineffectual, neglectful and brutal leader. His signet ring represented the flaying of Marsyas by Apollo. Cicero mentioned signet rings in his writings and Pliny (23/4-79 CE)cited that the fashion of wearing signet rings eventually shifted from being worn on a ring finger to the little finger. Michelangelo is most noted for his famous portrayal of Adam with his raised arm in fingertip union with God ...wherein God communes with His own creation, which he painted in oil on the ceiling of the Sistine Chapel. The face of Michelangelo's signet ring contained a carving of a segment of the Sistine Chapel. How is a Masonic Signet Ring Created? The basic ring is first created without any ornaments upon its face. Into its oversized flat metal surface is cut (or incised) an imprint of the symbol or symbols which the wearer wishes to display, such as you can see on the signet ring at the top of this page. This symbol is, in most cases the Masonic square and compasses, with or without the Letter G at its center, depending upon jurisdiction. In other words, a negative mold is formed in order to create a positive image, much as you might pour lead into a form to create a fishing weight. 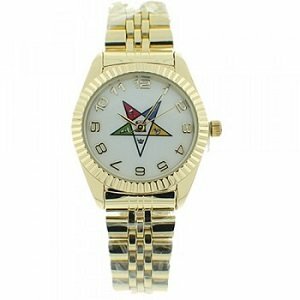 A true Masonic Signet Ring leaves a raised (positive) design upon the material onto which it is pressed, (usually wax). When pressed into the soft material, the material is forced into the incised (indented) area of the ring's face and this creates the raised image design in the wax being stamped. It is the opposite of a (raised face) type of ring, which leaves an indented design in the wax. Below, is an example of a genuine Masonic signet ring. 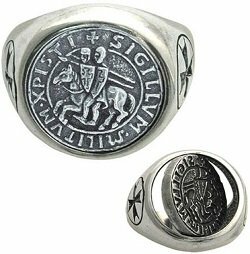 This is a handcrafted, reversible, Knights Templar signet ring made of silver by Marto of Spain. They also handcraft functional reenactment battle swords and various weapon types, replica Templar suits of armor, chain mail, and other Damascene jewelry and gifts at their factory in Spain. The face of the ring is the stamp of the Templar Order, emblemized by two knights mounted on the same horse. This represents the duel vocation of the order - religious and military. The Latin inscription "sigilum militum Xpisti" means the Stamp of Christ's militia. The reversible insignia, dual face of the ring bears the Seal of the Templars. One side is in relief, and the other side is intaglio (depressed) in order to allow it to be used in creating a wax seal. Here is a larger image of the face of this signet ring. Most Freemasons today, do not need to place a seal into wax on any of their important papers and, therefore, most modern rings are of raised-face or flat-face design. However, this signet ring exemplifies the genuine, original design and construction of the seal of the Knights Templar Order. On which finger should I wear my Masonic ring? There is no right or wrong finger or right or wrong hand on which to wear your Masonic Signet Ring. Most married men wear them on the opposite hand from which they wear a wedding ring...usually on their 3rd finger. They are also popularly worn on the little finger. If I lay my hand out flat in front of me, should the 2 "legs" of the Compasses point toward me or point outward and away from me? This subject is one on which Grand Lodges have made no regulation. Popular opinion seems to be widely divided. But, let's look at this more closely. When the emblem of the square and compasses is displayed on a building, or a button, universal custom requires that the points of the compasses point downward. When displayed on the Altar they point away from the Master. While you may wear your ring with the 2 legs of the compasses pointing toward you,...as some say, to help you remember your obligation,...historically your Masonic Signet Ring is an outward showing to others denoting your "Seal of Authenticity" as a Master Mason. The 2 legs of the compasses should, therefore, face away from you...just as the original signet rings did, which were used to imbed the image of their "seal" into the wax...so that the resulting waxen seal which was created by the ring has both legs of the compasses pointing downward. 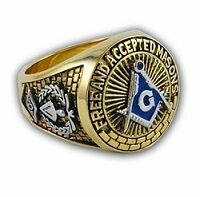 Modern day Freemasons proudly wear their Freemason rings as a symbol of their ongoing obligation of loyalty, their brotherhood and as a visual statement that they are a member of the oldest fraternity on Earth. 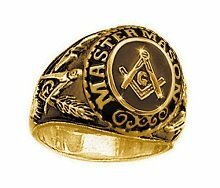 A Master Mason ring can also be called a Blue Lodge Masonic ring or a Masonic Signet Ring because the word "signet" denotes the actual construction of the face of the ring. 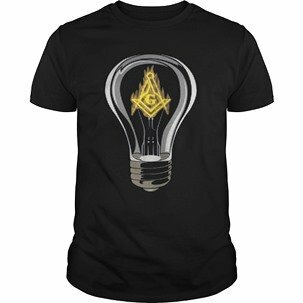 How Long Before A Member Can Become a Master Mason? In the past, in the United States, it may have taken 7 years to receive a Master Mason's degree. Within most U.S. jurisdictions in the United States, today, members may receive their Entered Apprentice, Fellow Craft and Master Mason degrees within a few months. Other jurisdictions and other countries may receive their Master Mason degree after a period of a year and in some jurisdictions around the world, becoming a Master Mason may take 7 years. These jurisdictional differences are largely responsible for the length of time it takes to receive a Master Mason's degree, as not all jurisdictions around the world have proficiency requirements. 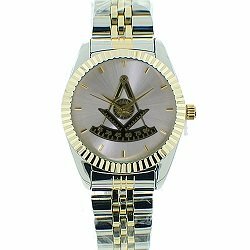 Upon completion of their Master Mason degree, like their brethren, many wish to display their "Seal of Authenticity" as a Master Mason by purchasing and wearing a Masonic signet ring.